Shaped with Enduro-centric geometry, this tubeless ready, E-Sommet VR is designed to be ridden fast and furious, with the addition of the Shimano E8000 STEPS motor making it an energy-efficient choice for getting you up the hill and letting you ride rowdily all the way back down. Equipped with a pedal-assist system which saves tyre wear and improves efficiency, this well-tuned engine is ready to push you to greatness. Rolling on wide Maxxis 3C tyres, the E-Sommet is brimming with high-end tech, fit for this beast of a bike. A RockShox Lyric Charger 2 RC2 Boost, 27.5”, fork with 170mm of travel and Super Delux RC3 rear shock ensures every impact on your way down the hill is soaked up immediately while SRAM Guide RE disc brakes keep you in control of speed and descents when you need to drop anchor. Providing all of the pedal propulsion is a brilliant Shimano SLX 1x11 gearing setup that you can work hard to fully feel the benefit when switching over to the motor. Taking your Enduro experience to the next level, E-Sommet VR Electric Mountain Bike (SLX 1x11 - 2019) is an unrivalled downhill dominator. Vitus E-Sommet VR Electric Mountain Bike (SLX 1x11-2019) is rated 5.0 out of 5 by 2. Rated 5 out of 5 by PaulAE from Rewarding I pondered long and hard about getting an ebike. I was worried on several fronts - very expensive, could I justify it; would I still get a workout; would I feel like a cheat when on rides; how would I cope with lugging around the extra weight; would the increased risk of theft, particularly when away from home with the bike, freak me out. As you can already tell, I am a bit of a worrier! What clinched it was my wife. She's had two big back ops over the past 6 years and I also have a prolapsed disc. We have always ridden MTB's, initially solely off-road, more lately on cycle paths and easy trails. Due to health issues and being mid to late 60's, no matter where we ride, we need the help from good suspension, even though we pay the price re weight and speed. Last week a shiny black Vitus arrived (unfortunately with no notice - we were in but it buggered up the surprise I had planned). It was easy to complete the assembly and I was soon out on a test ride. Even though we hadn’t set the suspension, or even sorted out the very hard tyre pressures, it was a delight. My wife and I did a hilly 16-mile circuit on Sunday morning and she was super pleased. I did 10 miles through local woodland a day later and had a ball. I climbed areas that I never managed 25 years ago and came home breathless, sweaty and tired! We’ve now done 35 miles of mixed riding, as much as possible on the eco setting and still have 50% battery left. 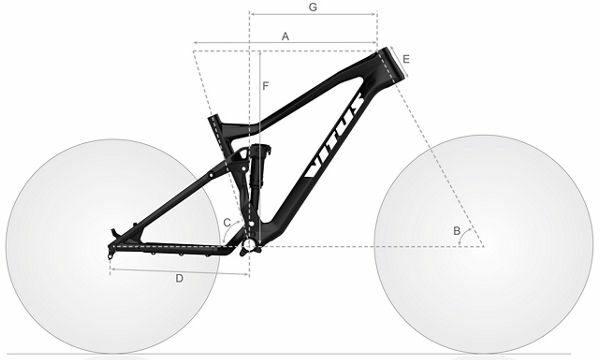 So, would I recommend the bike/eMTB’s – you bet! I reckon that we’ll now get much more off-road work in and we also intend doing a 4-day, 200-mile, quiet road journey in July. It’s early days still, but Wiggle have given me a 17%, time limited, loyalty voucher and I’m just about to order another bike so I can keep up with my wife!!!! Only a few small disappointments - I suspect that the bikes may be assembled by Wiggle mechanics in the UK and, if so, wondered if I may be able to order a bike more specific for my wife. A higher steering tube (if they cut them to suit), the slightly shorter dropper seat post and a lady’s saddle. Unfortunately, they can’t deviate from the spec offered, but for the price, I guess that I can’t grumble. I also had a good phone conversation with Sam earlier, who gave me good advice and answered my questions. It’s always reassuring to know that a “real” person is available to back up the web-based shop. Rated 5 out of 5 by Ridebigtakechances from It's electric My e biking experience didn't get off to a good start. My first Vitus e-sommet broke down on the first ride. Wiggle couldn't have been more helpful though and a replacement bike arrived a few days later. It broke down on the second ride. This time wiggle paid for a repair at my local bike shop and things have been fine ever since. The bike itself is amazing. I can't tell you how much fun this is. It's no lightweight but it still feels agile at speed. And speed is what it's about. With 170mm of travel and double wall maxxis tyres it has all the kit you'd like for going down but without the worry of having to pedal all that extra weight uphill yourself. I think the extra weight actually makes it handle better. It's smooth over rough ground and corners like it's on rails. It's amazing where you can get with this bke. Imagine climbing a steep technical climb, on grass. It's the sort of thing that would have me pushing on a normal mtb. But this bike just keeps on going. I was worried riding an e bike would be bad for my fitness. And I think you could sit back and let the motor do all the work. But if you pedal just as hard as before it's still a great workout. You just go much faster. And fast=fun. I have always seen uphill as a necessary evil for riding down. With an electric motor helping me uphill I need to use the berms uphill too. The ups are as good as the downs. Highly recommended. What is warranty on frame components battery and motor? The frameset has a warranty of 5 years. The battery and motor have a warranty of 2 years or 1000 cycles. The drivetrain and gear components also have a warranty of 2 years. The front and rear suspension both have a warranty of 2 years. You'll need a 1 1/8&quot; headset for this bike.